Caught this in the news yesterday. After being with ABS-CBN 2 for the longest time (I wouldn't know how many years exactly; i'm not a fan. 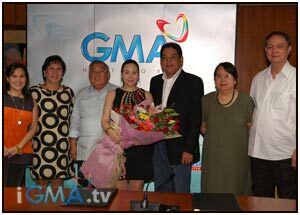 ), Claudine finally hopped fences and joined rival network GMA7. At first, I found it weird. She is the face of Star Magic, one of the most prized possesions of ABS-CBN. Seeing her make that huge move makes one think what could have happened. Anyway, that is none of my business. What just stuck me was the realization that change really in inevitable. Your friends now may no longer be your friends tomorrow. Your enemies now may become your BFFs tomorrow. Your life now may not be the same in the future. There is always change. And that statement is never easy to accept to most, especially to some who dread change (like me!). They say change is always good. I say, yeah, it may be, but with it comes the risk, and that is what I am not always accustomed to. I was never a risk-taker. I always want to be sure. I am at peace with security. I always ask for a guarantee. Yeah, I know. That will not always be case. For certain things happen beyond my control. But I'm slowly trying to learn. I am beginning to learn to be open to change. I just hope the day will come when I can fully embrace it.